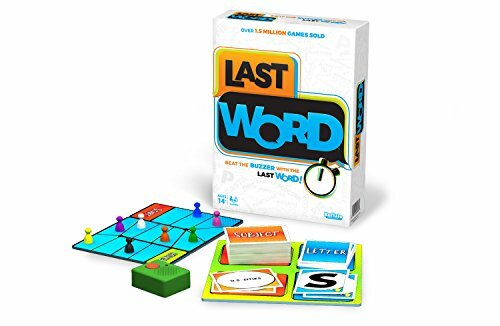 A fast paced, word-based game that challenges vocabulary recall. We found this best for groups of 6 or less. Players shout out words that match the Letter Card with the Subject Card. It sounds simple, but when racing against the clock, how many dog breeds can you come up with that start with the letter P? As everyone uses up possible choices, it becomes harder and harder to be the player who gets in the last word. Getting positive feedback from users, this game appeals to word nerds who want fast paced thinking. We prefer playing this one in smaller groups, with under 7 or so people. More than that, and it easily turns into chaotic noise with everyone shouting all at once. Box includes 8 player pawns, 230 Subject cards, 56 Letter cards, 8 Trade-In tokens, electronic timer, gameboard, and instructions. 2 AAA Batteries are required for the buzzer, and are not included. A round starts by each player drawing a Subject card, which they keep hidden from other players. A Letter card is turned over, visible to all players. Once the Letter card has been revealed, the race is on. Each player shouts out a word that starts with the Letter shown and fits the criteria set by their Subject card. The first player to shout out an answer lays their Subject card down and hits the timer. This is the Subject card used for this round. For instance, if there are four players, then each player will draw a Subject card. A Letter card is turned over. Let’s say the Letter is M. Player 1 has a Subject card that says “Things That Are Carried” and Player 2 has a Subject card that says “Dog Breeds.” Player 1 shouts out “Money!” and slams their Subject card down on the board, only a fraction of a second before player 2 yells “Mastiff!” Because Player 1 landed their card onto the board first, their Subject card, “Things That Are Carried,” will be the Subject card used for this round. Player 1 hits the timer. As soon as the timer is hit, all players now come up with answers for the Letter and Subject card. The last player to shout out a valid answer before the timer buzzes gets to move their pawn one space forward. Words can only be once, so it is in a player’s best interests to listen to what other players are saying. The round is over when the buzzer STARTS to sound. Any word not yet completed before the timer goes off will not count. Continuing with our example, Player 1 shouts “Manwhich!” Player 2 says “Muffins!” Player 1 gets out “Mocha,” as Player 3 says “Memories.” Just before the buzzer goes off, Player 2 says “Money!” Because “Money” was previously used, Player 2’s word is discounted, making Player 3 the winner for that round. Player 1, whose original Subject card was used for this round, draws another Subject card. The first player to reach the end of the gameboard is the winner. This game requires good ole’ fashioned sportsmanship to be fun. There will be times when a word is said by two different people, and one of them must yield to the other player. There will be times when players will have to make a group decision on whether or not a word really meets the Subject criteria. Each round only takes about 20 to 40 seconds, so it’s easy to get worked up during gameplay. Players who are more interested in gaining points rather than having fun may not be suitable for this type of game. We agree with the recommended age of 14 and up. Based on the need for cooperative and patient gameplay, along with a decently sized vocabulary, we think younger children may not be able to fully enjoy this type of game. If younger children are in the group, we suggest forming teams. There are no terribly inappropriate Subject cards. One is for “Cocktails,” but that card can easily be left out of the deck if desired. Advertised as a game for groups, we found that having more than 6 people can easily get frustrating. Even with the most generous of players, being able to figure out who gets the point when several people shout out a word right before the buzzer can lead to a less-than-thrilling gaming experience. The buzzer is made to randomly select a time between 10 and 30 seconds for each round. The randomness of the time is so that players can’t simply hold back on their answers and wait for the last second in the hopes of sneaking their answers in after other players have run out of theirs. We have not found any significant difference between the first and second editions, other than price. The number of spaces on the game board is the same, though there might be a few Subject cards that have changed. We would not recommend this game for groups of 7 or more. 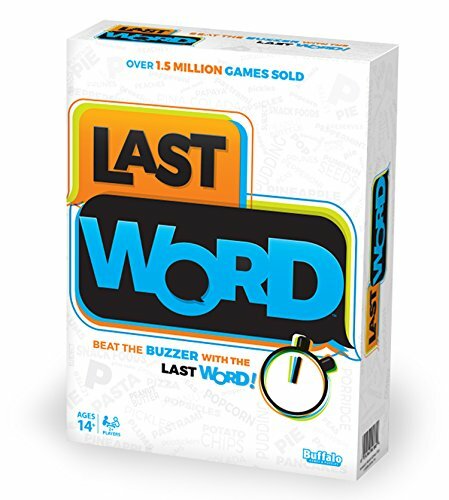 Each round players blurt out answers to "Subject" and "Letter" combinations (like "Snack Foods" that begin with "P") in a race to beat other players and get the last word before the buzzer! Win the round and advance toward the finish. How many "Things That Are Carried" can you name that start with "S"? Suitcase, scissors, snake, sandwich... Think you could get the last word? Recommended for 2 to 8 players, ages 14+. It's a great family game! Contents include a game board, 8 pawns, 230 subject cards and an electronic randomized timer. (Batteries not included.) Winner of 8 major awards and over 1.5 million sold. Made in the USA.